It’s a crazy time in your toddler’s life. They’re growing up so fast. They’re learning all sorts of new things about the world. They’ve just started to get this whole “walking” thing down, they’ve assimilated the word “no” into their vocabulary, and they’re even ready to start learning some of the more complicated stuff. Nah, we’re not talking about numbers and math! We’re talking about something that’s even more important! We think that it’s time to teach them about the Transformers. Robots in Disguise, if you will. Of course, you have to begin by teaching them which Autobot is the best one… Bumblebee. Yes, Optimus Prime might be a common favorite, but he’s definitely not the best. Only Bumblebee can take that mantle. After all, he’s a bright yellow race car one second and a totally awesome robot the next. This particular toddler Bumblebee costume helps you teach your child that valuable lesson. 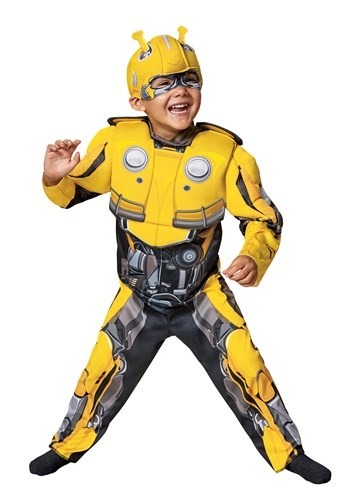 This Transformers Bumblebee costume transforms your child into the character from the Bumblebee movie. It comes with a yellow jumpsuit that has muscle padding in the chest and arms. The front also has printed mechanical parts on the front and along the legs. It also has 3D back pieces with printed details. The finishing touch to this costume is the mask. The mask is made out of a soft foam material and has holes for your child’s eyes. It also has a pair of antennae sticking out on the top! Once your child is all dressed up in this adorable costume, they’ll become the newest Autobot defender. You can teach your little one how to defeat Decepticons in style! If you really want to go the distance, teaching your child about the Autobots, you could get one of our adult Optimus Prime costumes to lead your little one into the battle against the evil Megatron!